I would love to say this means he is a little crazy. Because, well, I enjoy calling him a little crazy. But to be honest, I totally get it. Who wants to spend all of that time preparing to do something? I want to just do it already! Have you never seen the pin that clearly informs you that ‘Life is Not a Dress Rehearsal’?!? C’mon, people. This is why the huge bag of quinoa that I purchased (with the best of intentions) at Costco sat, unopened, in our pantry for so long. So, so, so long. It kind of intimidated me. At the very least, the thought of cooking with it somewhat annoyed me. That is, after I saw the word ‘rinse’ in the cooking directions…after it had already been paid for, of course. Sure I wash my fruits and veggies, but I (thought) I knew that the quinoa ‘rinse’ was more in the scary ‘bean category.’ Meaning, soak for 30 minutes, rinse for awhile, still have no clue as to whether you did all of this correctly…and all of this before you have to begin the actual cooking. That would be why there are at least 6 bags of a variety of dry beans in my pantry, as well. Scary stuff, that rinsing and soaking. In any event, something made me double check the quinoa directions and I realized something: I actually just had to rinse it. No, really. Like, put a cup of quinoa in a mesh strainer and run cold water over it for a minute or two before cooking it. Hello, Annie. Get a grip. Soooo not that hard. Oh, and cooking it? Only requires putting it in a pot with water, bringing to a boil and then simmering with a lid on for 15 minutes. I feel like such a fool that I let a delicious, easy and ridiculously healthy food item sit in my pantry for so long due to unfounded fear. And in all seriousness, this dish has grain, protein, vegetables and dairy. Oh, and it is delicious. It will take you less time to chop these two items than it will to make the person on the other end of the phone understand that you only want mushrooms on half of the pizza. Seeing it makes me want to eat it all over again. It is that good…..in my most humble of humble opinions, of course. Don’t be greedy. You shouldn’t want for more than that. Just make this. Trust me. Rinse the quinoa under cold water until it runs clear. This only takes a minute or two! Please don’t stop reading after that first line! 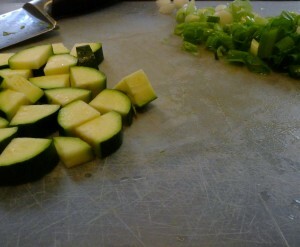 Chop the zucchini and 3 scallions and sautée them in a pot with some olive oil for about 2 minutes. Put two cups of water and the 1 cup of quinoa (or any 2:1 ratio, depending on the number of people you are serving) into the pot with the zucchini and scallions and bring it to a boil. As soon as it boils, drop the heat down to low-medium and put a lid on it for 15 minutes. (I know I can be rude, but I am not telling you to shut up. Actually put a lid on the pot and walk away.) Just make sure it is simmering and not boiling once the lid is on. Fluff the quinoa and serve it. Then top it with crumbles of the feta. Any feta will do, but this works really well with a block of somewhat creamy feta. We found a Bulgarian one that was perfectly creamy, crumbly and tangy (Oh, so tangy!) for half of the price per pound of the French and Greek ones. Use salt, pepper, and even hot sauce, to your liking. Garnish with some fresh chopped scallions, if you wish. Clearly I am just babbling now in order to make this seem longer, since it is SO DARN EASY. Pretty soon I will be telling you what color plate to use, just to make it fill a second page. Even though I am mocking my own bossiness and babbling, I can honestly say I would suggest finding a Greek white wine to serve with this – you know, just to be appropriately theme-y and to keep it fun. 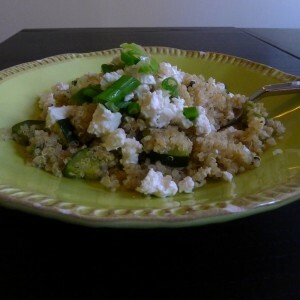 This entry was posted in What's for Supper Wednesdays and tagged 15 minutes, easy, Greek, quinoa, supper, weekday. Bookmark the permalink. Follow any comments here with the RSS feed for this post. Post a comment or leave a trackback: Trackback URL. Now planning to make this tonight! 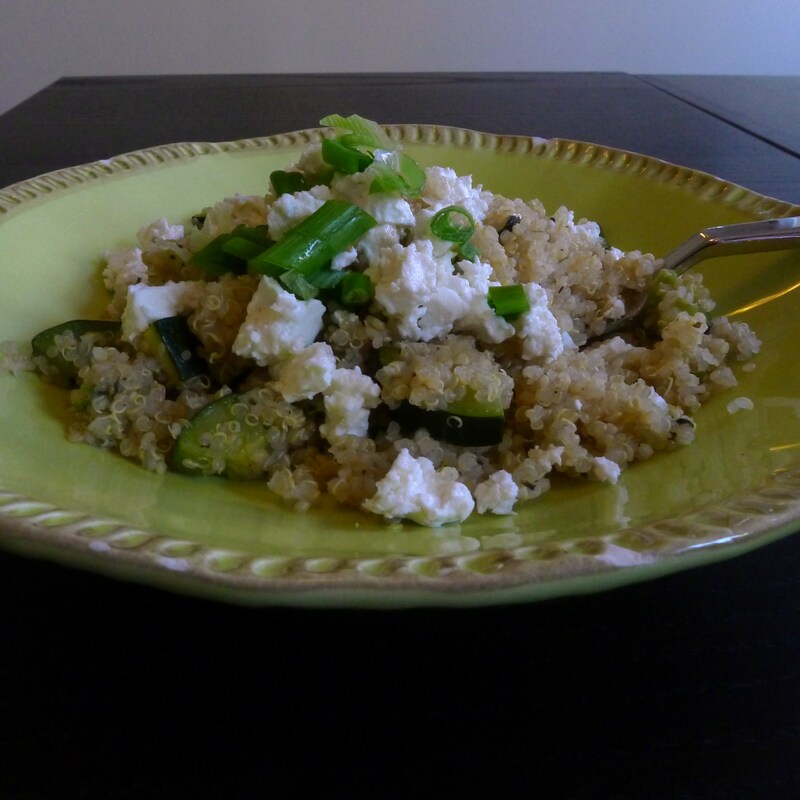 I’ve had a box of quinoa in my cabinet for months – I knew it was good for you, I just didn’t know what to do with it. Going to try this soon! kinda like how when i first tried to read your blog and it made me sign in and i tried a couple times with no success so then never tried again for fear of taking too long to figure it out. but glad i finally was able to figure it out now!! Monica – Did you every make this?! How did it turn out? Do you think someone in the medical profession would suggest we eat more quinoa due to it’s healthy qualities??????? ?